The Kuhn GMD Premium Series mowers offer increased durability, more features and simpler operation. The GMD 240 has a working widths of 7’10". Special attention has been made to optimize structural strength for years of low maintenance hay production. 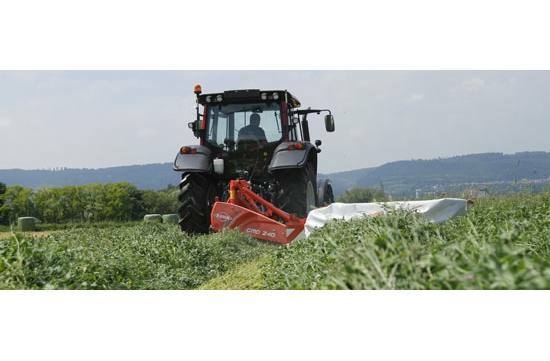 Featuring the 100 Series cutterbar with heavy-duty discs, the GMD Premium Series mowers cut hay at a flat cutting angle, reducing dirt incorporation and increasing knife life. The cutterbar is equipped with Protectadrive® safety, helping protect against damage if an obstacle is encountered. Transitioning between headland and mowing positions is completed by single-lever control. Hookup to the mower is fast and easy, featuring a Cat. 2 hitch with quick hitch compatibility. An outer swath wheel provides clear separation of cut and uncut crop.